thrifty | live. laugh. love. Ranch House Chicken…you won’t believe how easy! *Easy: I managed to reduce it to 3 steps. Oh yea. Okie doke, let’s get to it! Step 2: prepare your soup concoction. 1-Remove skin from pieces then arrange chicken in casserole dish. 2-In a medium bowl combine the soups, sour cream & 3/4 of the Ranch mix; stir well then pour evenly over each piece of chicken. (I ended up adding about 6 Tbsp of milk just to increase my liquid & loosen up the consistency a bit. Use your best judgement.) Sprinkle the remaining Ranch mix over all. 3-Bake at 375° for about an hour (or until juices run clear) then serve & enjoy! I enjoyed the ease, overall cost & taste of this recipe…chicken is my “go-to” meat & there are gobs of chicken recipes out there. I felt like maybe next time I’ll double the Ranch mix because while it had a good taste it wasn’t necessarily a ranch taste. I didn’t include it in the recipe (hey, I’m proud of getting it down to 3 steps-I don’t wanna ruin it!) but I finely chopped some green onion & mixed it into the soup concoction; this would be totally your call…do you like green onions or not? While the original recipe suggest mashed potatoes & green beans (I think?) as sides–which does sound delish–we just had mashed potatoes so I subbed fried eggplant & cooked carrots. 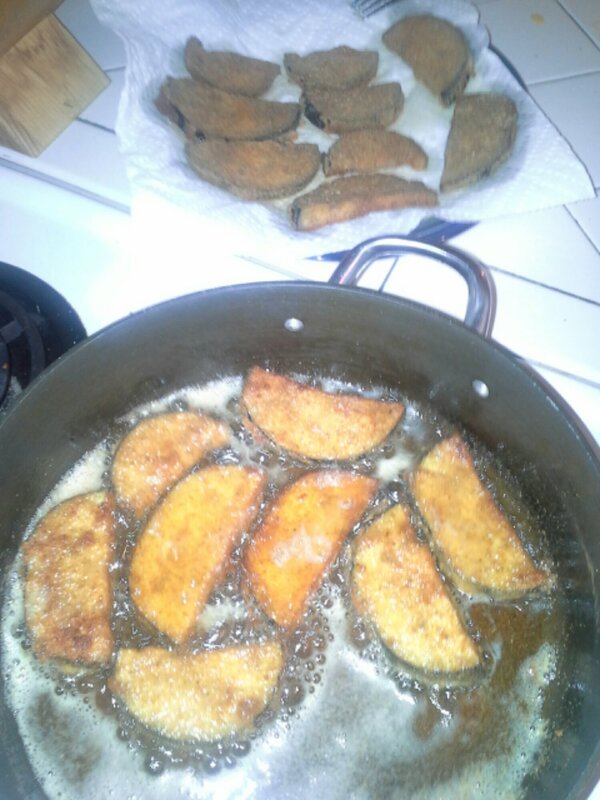 I’ve been wanting to try a simple fried eggplant recipe anyway! 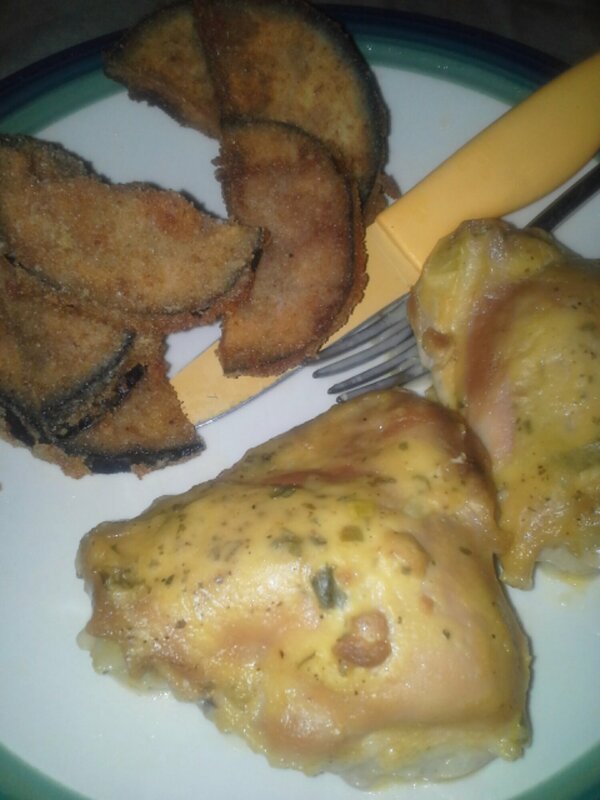 As usual, Allrecipes didn’t disappoint & (I’ll be honest) I was surprised…fried eggplant is gggooooooddd! I know, I know…eggplant…ick–what the hell?! It can’t possibly be good because it sounds so weird. I can’t explain it: it’s almost like squash. It wasn’t what I expected but in a good way. I got a huge one for $1.34 at Walmart so you should try it…at least if you don’t like it, it won’t of cost much so you won’t lose much. One of our family sayings is “Try new things one time” & I’m proud to report each little duck took a bite. Reviews were mixed but I think that’s due more to the odd name than the subtle taste. So here lately (aka approx. 6 months) we’ve been broke. The husband would probably not appreciate me airing our finance issues, but I’m cool with it because I know we’re by far not the only ones, and I’m praying to sweet baby Jesus that it’s only a temporary set-back. Anyway…being broke forces you into doing things & trying things you never have before, such as making your own laundry detergent because you’ve run out but there are zero dollars to buy more yet everyone still needs clean clothes because the world doesn’t stop turning & clothes don’t stop getting dirty just because you’re broke. Right? Right. I have quite a few packages of bar soap…it used to be a ton & I acquired them during my coupon heyday. I googled a recipe for homemade laundry detergent (found one that I almost had all the necessary ingredients) & got to work. Let me tell ya…do not be daunted by the sound of this activity. It’s very simple & cost effective & even better (as far as I can tell anyway): it actually works! So whether you’re currently broke like myself (by the way…I don’t mean the kind of broke that some assholes claim they are yet they have all their basic needs met & then some, which in my opinion is not truly broke, it’s just lying for sympathy(?) or attention (?)) or just curious or trying to save a few bucks or maybe you’re just a Crafty Little McCraftster….try the recipe out & let me know what ya think!! Add 6 cups of water to a large pot. Stir in grated (I only chopped my soap & some of it didn’t melt completely so I’d definitely take the time to grate) bar soap; heat over medium high until melted. 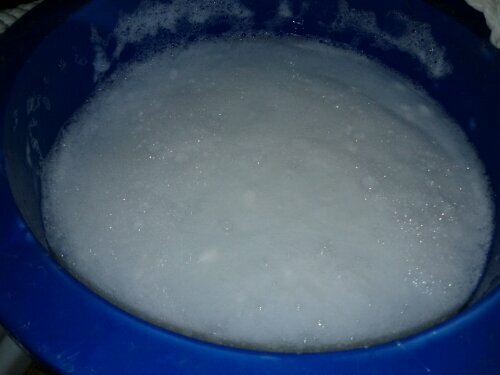 Add borax & washing soda; stir well until dissolved. Add 6 cups of warm water, mix well with a whisk. 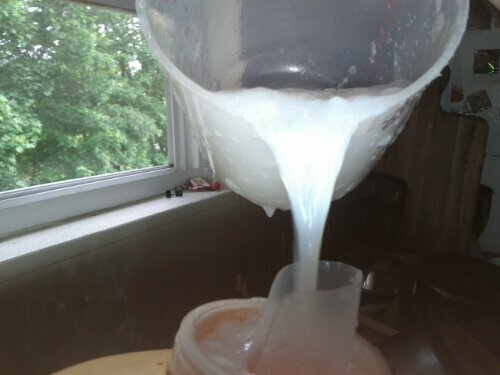 Add 1 gallon (I used a freshly emptied milk jug) cool water, mix well. Stir with the whisk every 30 minutes until completely cool (I bolded this because I was lazy & did not do this because it felt “cool enough” to me; I think that’s why I ended up with some chunkiness in the end. Don’t let laziness mess up your results!). Cover & let it sit undisturbed overnight. In the morning you may have to break up some solidified soap on the top & stir well for a little bit just to mix it all up good. 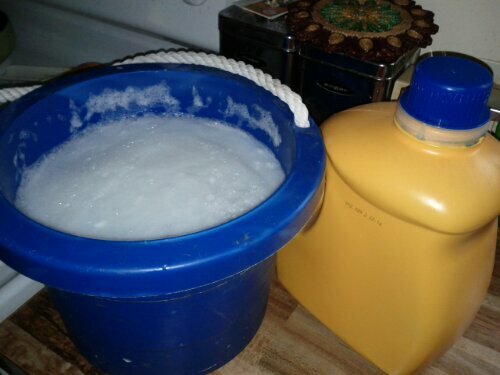 (aka Dollar Tree conditioner; aka you know what I’m talking about if you’ve ever experienced true broke-ness) & you can pour it into containers for storage & distribution (I used the freshly emptied laundry detergent bottle+the milk jug). 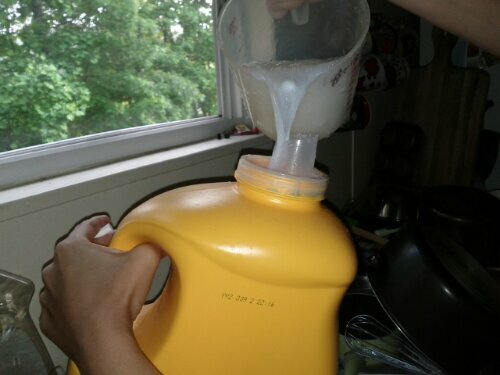 When ready to use just give it a couple good shakes, use 2 oz. for small loads/4 oz. for large loads (or just fill the detergent bottle cap up like myself) & you’re off! See how clean your clothes can get & truly at a fraction of the price of commercial detergent. I was so excited to come across this pin & immediately added it to my list of “Pinterest stuff I want to actually do ASAP”, and made sure to get the ingredients-which happened to be required by a couple other pins I was trying. I had just run out of Cascade (perfect timing) & I was super hopeful about this pin because dishwasher detergent is ridiculously expensive. 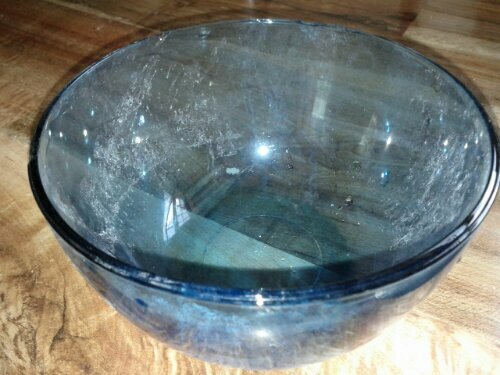 So I made a batch of the DIY exactly as it stated (very simple…all it takes is borax + washing soda, then some white vinegar when you actually run the dishwasher) & used it, exactly as it stated. Happy as a clam I started using this DIY mix regularly. Never once did I change my typical “dish habits”, even with the first run. I will usually rinse really dirty dishes off under scalding hot water before putting them in the dishwasher; the rest just go straight in. I don’t hand wash them then put them in or anything like that. 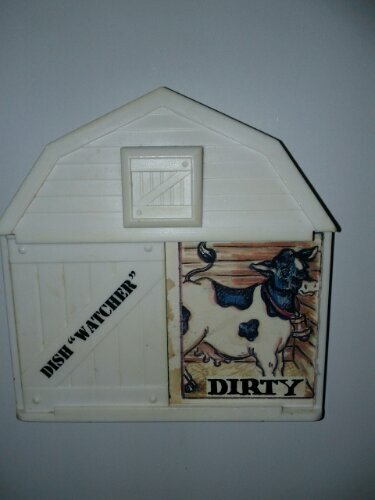 I kept an eye on my rinse agent level too because that’s where you put the vinegar. Now, after a few weeks of using this mix, I’ve begun to notice there is always a film on my dishes when they’re finished. I’m very displeased & disappointed with this latest development. Is it some sort of build up from the borax and/or washing soda?? Should I be running some sort of cleaning cycle periodically?? I’ve tried troubleshooting this problem…I’ve made sure I filled the rinse agent with vinegar; I’ve added extra vinegar to the bottom; I’ve cut back the recommended amount (2 Tbsp) of mix; I’ve added a tiny bit more mix; I’ve rinsed the dishes off a little more than usual; I’ve run a second rinse cycle after the regular cycle. Nothing is working. No matter what I try I simply cannot bring back the glory I first experienced. It is not from food, or me being lazy & throwing in dishes with sandwiches & the like still on them. It is a soap type residue. If I take a damp towel or rag (which I’ve been having to do unless I want to hand wash every single dish) it buffs right off. Maybe I need to “splurge” and get some actual rinse agent? I guess I’d still be saving money on the detergent but it would be counteracted by having to purchase the $4-$5 rinse agent! I’m not sure whether to classify this as a scam or not…I don’t know if it’s just my experience…it does work-in the beginning-so it’s technically not a scam. You can find the original pin & instructions HERE, until I decide whether or not to move it to my Bullsnit Pinterest Scams board. Go try it (borax & washing soda are each $3-$4 per box) and PLEASE share your results with me!! This is obviously driving me nuts. This recipe was passed on to me from my best friend in the world, and she found it on the Kraft website under the “1 Bag 5 Dinners” section (which I recommended to her!). I made it tonight & it turned out delicious! Give it a try…even if it doesn’t seem like your thing…it ends up being a one-pot belly-warming dish that’s excellent for chilly nights. Heat oil in large skillet on med-high heat. Add chicken (I also tossed in some onion powder & paprika…I’m a spice lover), cook 5 minutes on each side or until cooked through. Remove & cover to keep warm. Add soup & milk to skillet, blend well with whisk, bring to a boil. 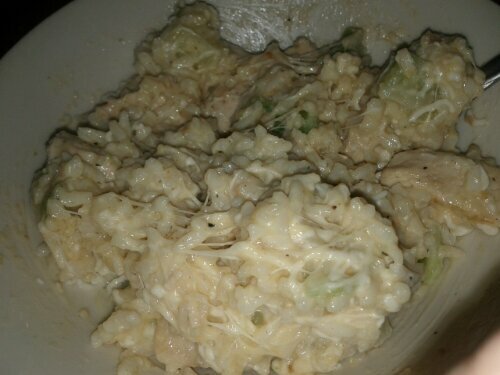 Stir in rice & broccoli; top (or stir in the pieces) with chicken. Cover & reduce heat to low (if you opted to cut your chicken into pieces occasionally stir the mixture so it doesn’t stick/burn). Cook 5 min. ; sprinkle with cheese. Remove from heat; let stand 5 min. or until cheese is melted. You can use whatever fresh/frozen vegetables and cheese you have on hand. Peas sound like a good choice! Leave me a comment & let me know how you like it! Homemade Starbucks: Iced White Chocolate Mocha. I’ve always been a coffee drinker and as everyone knows Starbucks has the best coffee around…that’s how they get away with charging so much for it. My first Starbucks love was a Grande Mocha Java Chip with Extra Chocolate. Mmm-mmm good! If you’ve never tried it then you definitely should. My new Starbucks love is a Grande Iced White Chocolate Mocha with No Whip. I’d tried the hot white chocolate mocha & it was pretty good but I’m not into drinking hot coffee during the day in summertime. My Sister was the one who told me about the same thing but over ice. It was love at first taste! It’s good with or without the whip but I’m not a huge fan of whipped cream anyway so I usually do without. My new “relationship” with the IWCM (iced white chocolate mocha) was becoming pretty costly so I started searching for recipes to make something similar at home. I needed a way to feed my addiction without starving my wallet. **Cream/sugar just in case you need it. —First, brew your KCup/cup of coffee the way you usually do. The KCups for iced coffee tell you to brew over ice but I don’t. If you put a little less water than usual it will give it a slightly stronger coffee flavor; you have to remember that you’re going to be putting it over ice which does melt and will water it down a tad. I usually stick mine in the freezer for a few minutes just to help take some of the heat off. —In a small saucepan (on the stove, med-high) dump about 1 to 1/2 handfuls of the white chocolate chips & 1/4–1/3 c milk. Stir together until completely melted & combined. I am particular about certain things & one of them is making sure the chips are entirely melted; otherwise you have little white remnants floating around which, to me, is just plain gross. —Almost done! Add ice to your cup of choice (I usually use a travel cup because they’re a bit taller), as much or as little as you want. Keep in mind that if you only add 1 or 2 pieces you’ll probably have to add more in order to have “iced” coffee, unless your coffee is pretty cooled off by this point. Mix your homemade “white sauce” into your coffee TO TASTE…meaning…a little at a time, tasting after each addition to see if it’s at a sweetness level you want. 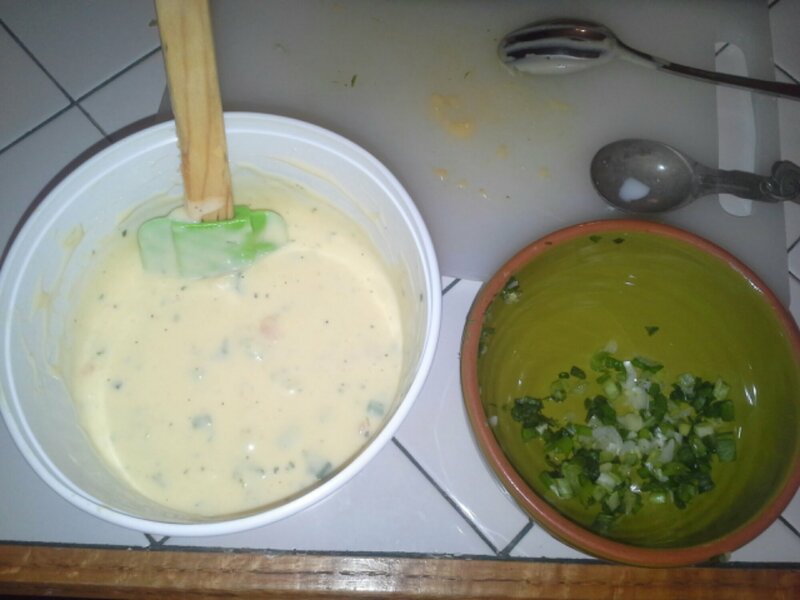 If you use all of your white sauce & it’s still not how you want it then feel free to add cream &/or sugar. —Pour this final concoction over the ice, give it a good stir, and sip away! You can top it off with whipped cream if you want. It’s your creation…customize it!